Subaru unveiled its new BRZ coupe at the Geneva Motor Show - the sister car to the Toyota GT 86, which was also on show at Geneva. The BRZ is a rear-wheel drive four-seater which is powered by the same 2.0-litre 'boxer' engine as the Toyota with 200PS and 205Nm of torque. The BRZ is the result of a Subaru-led joint development with Toyota with Subaru providing the engine and chassis know how. It weighs just 1220kg and with a low centre of gravity promises keen handling and an enjoyable driving experience. 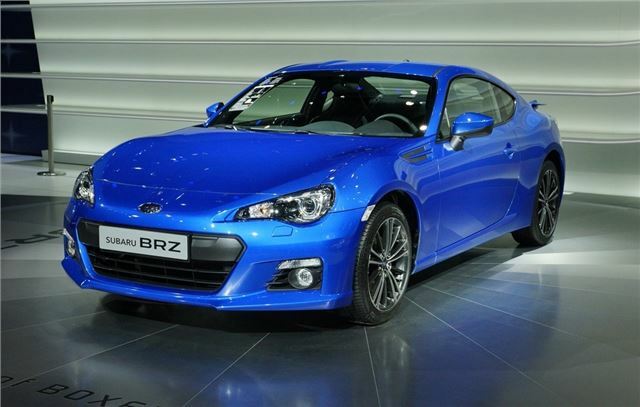 The newly developed 2.0-litre powerplant is exclusive to the BRZ and the GT 86. It's fitted with Toyota's D-4S direct injection technology, designed to improving efficiency. The standard six-speed manual gearbox features a short-stroke gear lever, which according to Subaru is optimised in rigidity, shift accuracy and weight. The optional six-speed automatic transmission has a ‘Sports’ mode for immediate shift response. In ‘manual’ mode it lets the driver change gear via steering wheel-mounted paddles and features a downshift ‘throttle blipping’ system, similar to that on the Nissan 370Z. The Subaru BRZ is set to go on sale in the UK in July 2012 and although prices have yet to be announced it's expected to cost around £25,000. Now that's what I call a car. Subaru never ceases to amaze me with every car they release. Having said that, please excuse me as I pick my jaw up from the floor. I think it is one of the most anticipated Car launch and I happened to see some snap shots of the car and its really cool. BRZ and GT 86 are really most awaited car models and the best part is that the newly developed 2.0 liter power-plant is exclusively for BRZ and GT 86. Anyways, thanks for the informative share.